It was supposed to be a good day! For the first time ever, three generations of our family were travelling to Wembley for what we all hoped would be the highlight of our season. Myself and my elder son had been supporters of Bradford City for years. But this season, thanks to the club’s forward thinking policy, had been the first for my seven year old grandson who had travelled from home in Lincoln with his dad to many of this season’s home games. Dad and grandad had been to Wembley with City three times but the prospect of a first at the national Stadium was a new level of excitement for the youngest in our family. Excitement the night before, choosing the right replica kit for the occasion (Colin Doyle’s keeper’s kit was the preferred option) and packing the Billy Bantam mascot were all things I could remember my son going through many years ago – now it was his son’s turn. It was supposed to be a good day. Once inside, excitement levels rose even more – easing my own trepidations – he was enjoying the moment as only the young can. As for the match…well sadly the Billy Bantam mascot failed to work on Billy Clarke’s good chance – it was a very good save really –and the air of inevitability that took over the older generations was confirmed when their goal went in. At the final whistle age and experience took over and, for the first time ever, we did not stay to applaud the players off the pitch – not because of the performance or result but just a gut reaction to the first of the “invaders”. A very brisk walk past riot-suited police who seemed to go unnoticed by my grandson saw Billy Bantam dropped in the crowd. Fortunately, City fans also in a hurry picked him up and returned him to his owner. The “underground” took us north back to our parked car – this being the real disappointment for my grandson as our stretch of the journey did not go underground – and a couple of hours later he was back home in Lincoln and ready for bed but he still told his mum and grandma that Wembley was “awesome”. It was… You just need the right perspective. P.S. I write this, partly to overcome my own disappointment but also to underline what our football club means to our family. If any of the owners, management, players and others involved with the club pick up on this piece I hope it confirms to them that they are doing the right things at the club and maybe it may go some way to ease the disappointment we all feel. We are by no means unique as a club, but the biggest difference in the two sets of fans at Wembley was the number of families in City shirts and scarves. Wembley is special in that way but City is special to so many families week by week in the way it brings generations together. And we will all be back in August! A good article reflecting my own thoughts, I went with my two sons, one of my daughter-in-laws and four grandsons. A good weekend in London for us, despite the result and the Millwall followers. The article echoed my own feelings about this ‘Wembley experience’s particularly in contrast to the other three visits. Even the 5-0 against Swansea proved that you can enjoy a great day at the national stadium without victory and, you know what, I was so proud of our supporters that day. I was proud of them last Saturday too as they were unprovoked by the Millwall fans and as the article says their were many families amongst the City faithful. Unfortunately the demographics of the Millwall support was more single men in their 25 to 45 age group without colours but obviously ‘not City’!! Thank goodness we are not tarnished so. I too don’t get the ‘ Nobody likes us-we do the care’ mantra and noted it was emblazoned on official Wembley merchandise. Millwall claim they have made efforts to improve their image winning them the ‘Family club of the year’s title and I heard that part of this was the erection of a covered walkway to protect visiting supporters on their trip from the station to the away section at their ground. Selling merchandise like that which was the large foam hands which are obviously aimed at younger Millwall fans encourages them to follow that ethos. I was also disappointed that statements made by the manager (high spirits) a player (fans have a right to invade the pitch) and the Millwall CEO which amazingly blamed Wembley for the pitch invasion did little to point out to the fans that what they did was wrong. Imagine if one of our players or Stuart had reacted with a punch under severe provocation? Imagine if our fans done the same! Would O’Brien still be saying that our fans had a right to invade the pitch? Imagine what it would have been like if we had won! So as far as a result was concerned it was a bad day and as far as the behaviour of their fans it was a bad day. The ‘Wembley experience’ was not a good one, maybe next time it will be better. But as far as our fans were concerned it was a good day. We have a lot more to be happier about and even though we start next term in the same division then so be it. Win like Millwall or lose like Bradford as someone said! Some great points as ever Mark, but one thing that has rankled me these last few weeks is the amount of people having a go at Millwall for winning “family club of the year”. In general terms, people haven’t actually looked at the reasons why they won. Apparently a club like Millwall just isn’t allowed to be considered for the title and that’s it. I get that they have a terrible element of their support and I was as angry as anyone on Saturday, but what – as you say – 25-45-year-old males do is very different to Millwall families. So in the interests of balance here is a short video of why Millwall won the award. If you have not seen it please watch it. Because to be frank, and speaking as a parent who takes his kid to watch City, I think there are some ideas here that City could learn from. I was making the point that there seemed to be little coming out of Millwall in the form of criticism of those who went onto the pitch. o’Brien with his “every right to invade” and their manager claiming it was “High spirits”. 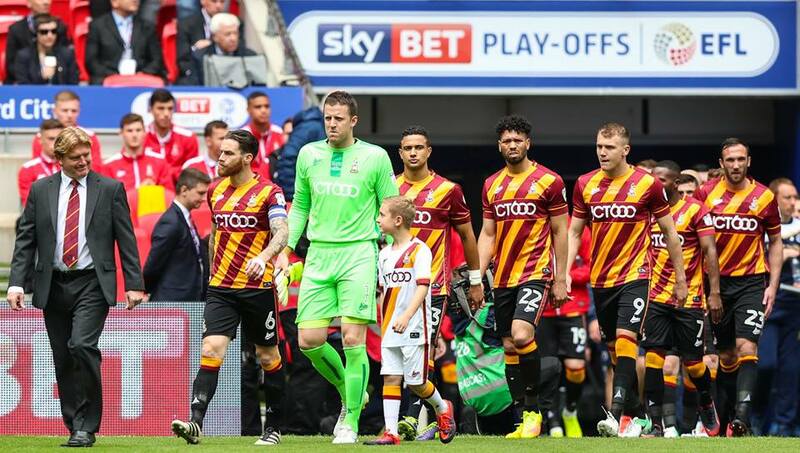 Their CEO laid the blame totally with Wembley and their security and said nothing about the fact they were doing wrong by being there, nothing about the goading of our players and staff and there was no apology to the Bradford fans. Remember we wanted to express our thanks to the team for a great season, and as its turned out farewell to one of the great servants of our club. My main point regarding the Family Club tag is the production of official merchandise containing the mantra ‘No one likes us’ etc. Surely this encourages the behaviour that presumably their efforts to win Family Club of the Year was seeking to eradicate. I heard someone from Millwall describing their efforts including the shelter for visitors to protect them from the station to the stadium. Shouldn’t be needed if they did things correctly. I think also the statements made enforced the negatives coming out of the club. If the CEO can’t see a problem. If a player thinks it’s ok to invade the pitch and presumably goad the beaten opposition, if the manager claims it to be just high spirits then there really is no hope is there. I have just received notification from a Millwall fan of another fan having to have facial operations following an altercation with a City fan. If true it is disgusting and hopefully an isolated incident but shows that we too have our nutters! But thankfully few and far between and if our fans had reacted to what we witnessed then goodness knows what we would be discussing now. I was really down Sunday. It was still a good day. My worry was Bradford would not come out, but the “almost” goal – it made sure the players and fans came out and they played and we supported. As for the game, we were as good as we are (which is pretty good, but with weaknesses), and Millwall as good as they are, with weaknesses, different approaches – I would have had the teams about equally good, with fine margins to decide it. I would have felt more confident against any of the other possible play off sides – Scunthorpe, Southend, whoever. I felt the Millwall way was the most dangerous to us, but that we were slightly “better”, cancelling out to about equal with a slight edge to Millwall. I thought their longer experience as a team together and at Wembley would tell. The Millwall fans. Many were alright to us going in. Many clapped when we clapped. Some booed the invasion. Some are the beyond the pale. But can’t tar them all. They can part their hair mind. They can sport a hair care product and know the value of the clippers on number 1 whether short back and sides or all over. Great tattoos. Would I have wanted to go up Bolton and Millwall? Not really. But the whole project, Rahic and Rupp (compared to what might have been), Stuart (compared to – Evans?! ), prices, crowds, ethos, enjoyment, excitement. Not perfect but so much feels right.